MAA - How to take ADVANTAGE of this knowledge? BIL - How to BENEFIT from this knowledge? MOJ - Why is it important that you HAVE this knowledge before it is too late? 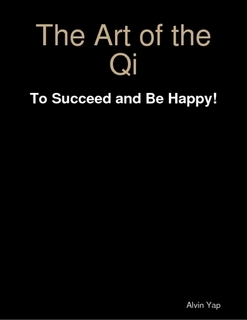 All the answers to the above questions will be revealed to you in our e-book "The Art of the Qi - To Succeed & Be Happy!" It is 247 pages. If you want to know how you can live successfully and happily, you will find it in the e-book. This is not a Ba Zi Reading but it is connected with Astrological Divination and Luck Activation. You will not find this from other websites or anywhere else except from our authorized publisher and distributor at lulu. The secrets in the e-book will set you free to live the life you want. It is UNIQUE,simple and effective! You will gain a lot of valuable insights that are priceless! If you buy from us directly, you will also get a Ba Zi e-book and a Feng Shui e-book free of charge. Together, it is worth USD19.80. Click the Buy Now button. Upon payment, please notify us at alvinytt@yahoo.com and we will email the e-book to you.